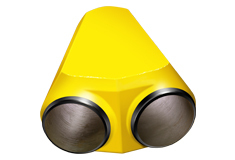 The Oil States Piggable Wye is a Y-shaped fitting for shallow and deepwater subsea pipeline applications that permits pigging and cleaning of lateral lines. Designs are available in both symmetrical and asymmetrical configurations for various pipeline applications. All designs readily accept standard pipeline pigs, including cup and disk models, for cleaning pipelines. Utilizes a thirty-degree angle of entry to ensure a smooth transition for the pig without the risk of hanging up. ANSI pressure Class 300 to 2500, API 6A ratings 2000 to 10000, ASME compliant design.